President Trump during a meeting on health care in the Roosevelt Room of the White House on Monday. Republicans have worked hard in recent weeks to convince members of the public that they shouldn’t be concerned if official projections show millions of people will lose coverage under the American Health Care Act, a House GOP bill that would repeal and replace parts of the Affordable Care Act, aka Obamacare. Instead, they should focus on access and cost. Those talking points came ahead of a highly anticipated report from the Congressional Budget Office,1 the nonpartisan agency that estimates the economic effects of legislation, that was expected to show a decrease in insurance coverage under the GOP bill. The report came out today, and it’s easy to see why the Republican focus has been on cost, not coverage. According to the CBO report, an estimated 24 million people would lose health insurance by 2026. Between now and then, however, federal deficits would be reduced by $337 billion, despite billions in tax cuts included in the bill. The biggest savings would come from cuts to Medicaid, the health insurance program for the poor, though other savings are also taken into account, like a $9 billion cut to a fund for prevention and public health programs. 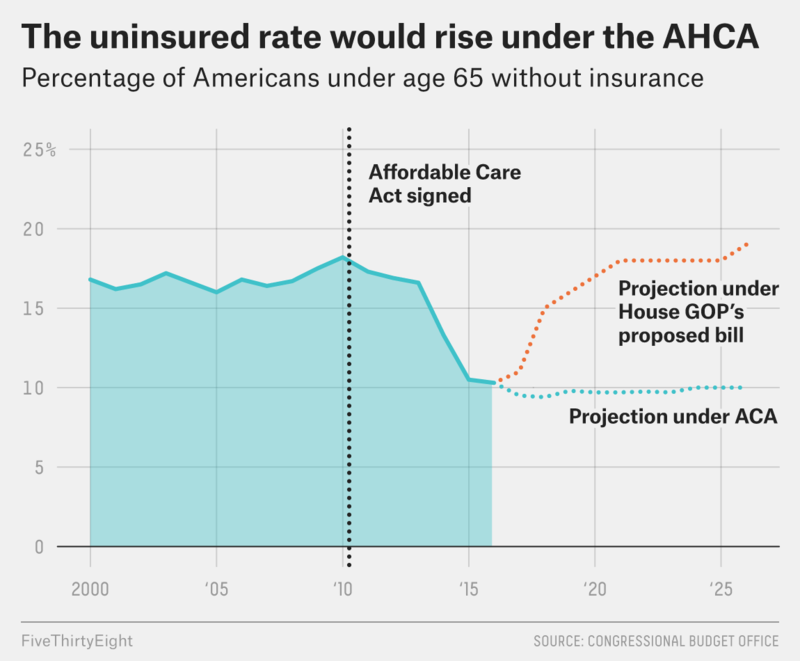 The uninsured rate would be higher than it was before the ACA: Not only would the absolute number of uninsured people increase, the share of the population without coverage would be higher than it was before the Affordable Care Act passed in 2010; nearly 1-in-5 people under age 65 would not have health insurance by 2026, according to CBO estimates (people 65 and older generally qualify for Medicare). The CBO gives a few reasons for this decline. The largest drop is from changes to Medicaid; the AHCA would cut the program by 14 million people by 2026, according to the CBO. Another 7 million people who currently have insurance through their employer would drop that coverage if the individual mandate — which currently requires that most people have coverage or pay a penalty at tax time — goes away, as it would under the AHCA. Still more people would lose insurance from the changes to subsidies, which help people pay monthly premiums. Insurance premiums would go up and then down: The CBO estimates that monthly health insurance premiums for individuals who buy coverage privately, outside of an employer or public program, would go up by 15 percent or 20 percent through 2019. That’s largely because without the individual mandate, it’s likely that fewer healthy people would buy coverage, making premiums more expensive overall (insurance premiums go up when the people who are insured are sicker overall and so need more health care). The CBO thinks those premiums would then come down, to about 10 percent less than current levels. There are a few causes for that. For starters, the GOP legislation allows for the sale of catastrophic plans that tend to have lower monthly premiums but don’t cover much of anything until a deductible is met. A person with catastrophic coverage will usually pay most of their expenses until the out-of-pocket limit (which is set at $7,150 for an individual, or $14,300 for a family in 2017) is met; these are plans that only cover health care costs during and after major events. Under the ACA, those plans aren’t available to most people. The proposed bill also sets up a fund for states to help insurers offset the costs of the sickest patients. The CBO says a decrease in premiums would also come as more young, healthy people signed up, relative to older adults, who tend to have higher health care costs. The GOP plan allows insurers to charge older people five times as much as younger adults, bringing the premiums for younger buyers down while they go up for older people. Subsidies to help pay those premiums would change: Under the ACA, millions of people pay less for coverage than the cost of their monthly premiums because they receive help from the federal government in the form of subsidies. These subsidies are available to people who buy coverage on the insurance marketplaces set up by the ACA. The Republican plan also has subsidies but changes how they are calculated. Under current law, the subsidies vary depending on a person’s income and location: Poorer people get more help, richer people less, and subsidies are more generous for people who live in areas where health care is expensive. Under the GOP plan, everyone earning less than $75,000 per year would receive a set amount based on age. It was already clear from the GOP bill that poorer, older and more rural people would receive less help buying insurance, while wealthier, younger people would receive more. The CBO drew the same conclusions and reported that those differences would likely shift who gets coverage. For example, in 2026, 21-year-olds would likely pay less for coverage under the Republican plan because premiums would be cheaper, even if they received fewer subsidies. But a 64-year-old who earned $26,500 per year would have to pay an estimated $14,600 under the GOP plan — compared with $1,700 under the current law. How the markets will maintain stability, however, is different depending on whether the GOP bill passes. Under current law, middle- and low-income people receive subsidies to offset the cost of insurance, which protects them from rising prices. Many experts believe that after increases in recent years, premium prices would have leveled off in 2018 under existing law. Under the Republican bill, subsidies would be reduced for many low-income people, but the costs of insurance would also likely go down, which the CBO predicts would encourage healthier people to stay covered. The deficit would shrink: The CBO estimates that the Republican plan would decrease government spending by $1.2 trillion over 10 years. But because the plan would eliminate taxes imposed by the ACA, the new bill would also reduce government revenue by $0.9 trillion. The net result: a $337 billion reduction in the deficit over a decade. That’s a bit bigger than the impact expected by some experts, but it’s small potatoes in the context of the overall federal budget: It would represent just a 4 percent reduction in the government’s $8.6 trillion deficit over the same period. Still, the CBO’s estimate is significant politically if not fiscally. Republicans plan to pass their bill in the U.S. Senate through a process known as “reconciliation” that allows them to avoid the possibility of a Democratic filibuster. But Republicans can’t use that process unless their bill reduces the deficit at least a bit — meaning that if the CBO had found that the bill would increase the deficit, the bill could have been dead on arrival in the Senate. The reduction in federal spending would come mostly from reduced spending on Medicaid ($880 billion) and from the elimination of health insurance subsidies ($673 billion). 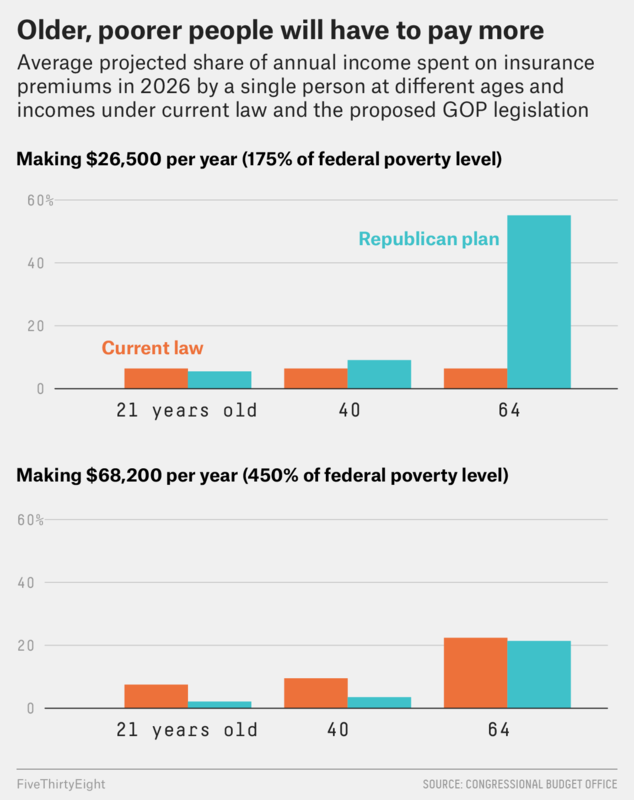 In other words, the Republican plan would cost less precisely because it would cover fewer people, many of them low-income families that qualify for Medicaid coverage under the ACA. (Both the spending and the coverage effects of those changes would be partly offset by the new health insurance tax credits, which would cost $361 billion through 2026.) Meanwhile, the drop in revenue would be driven primarily by the elimination of taxes imposed by the ACA — taxes that fell mostly on high-income households. So the Republican bill would pay for cutting taxes on the wealthy by reducing health care spending for low-income households. Still, the CBO report is careful to note that there is substantial uncertainty about its estimates. The agency’s analysts had to consider how a long list of groups — insurers, employers, patients and state lawmakers, among others — would respond to shifting incentives. “Each of those responses is difficult to predict,” the report notes. Comparisons between the new bill and the ACA are even more uncertain because the CBO could also be wrong about what would happen if the existing law remained in place. Technically, it came from the CBO and the Joint Committee on Taxation.